United Breast Cancer Foundation is a national nonprofit that began as a small grassroots organization serving low-income, under and non-insured women and men in New York State. UBCF is headquartered in Huntington Station, NY, and along with a regional office in Annapolis, MD, we currently serve women, men and their families across the country. UBCF is committed to offering breast health and wellness services focused on cancer prevention, screening, treatment and overall wellness. UBCF’s mission is to make a positive difference in the lives of those affected by breast cancer. Last month, on October 27th, 2018, we held our Tempur-Pedic ® Mattress Event in Owings Mills, Maryland. This is UBCF’s second Tempur-Pedic ® mattress event of the year, and our first time in the Baltimore area. The exhaustion that comes with putting the body through rigorous treatments can make recovering very difficult and lengthy. Most people will agree there is no greater impact to your health than restorative sleep, which is why UBCF’s mattress events have such a tremendous impact on so many people. Too many people are sleeping on sofas, recliners or old, lumpy mattresses and cannot afford new ones, especially considering the cost of cancer treatments. UBCF’s client Kyla drove all the way to the Maryland event from her home in Boston, Massachusetts to receive a new mattress. The distance Kyla was willing to travel to receive the gift of better sleep is a true testament to how important good rest is for those battling diseases like breast cancer. Kyla was thrilled to receive her new mattress and the Pink Bags full of goodies we provided her. The joy and excitement evident on Kyla’s face was truly magical. 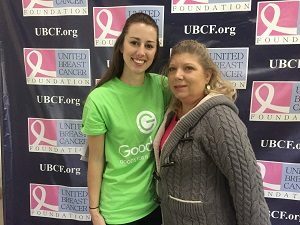 With the help of Good360 and Tempur+Sealy, UBCF has donated thousands of mattresses to breast cancer patients and survivors who, like Kayla, truly need and deserve a good night’s sleep. We truly understand the importance of rest and have worked together with Good360 and Tempur+Sealy to help those who can’t help themselves. 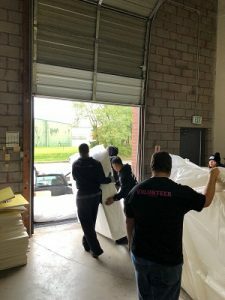 At our most recent mattress event in Baltimore, Maryland, UBCF donated 300 mattresses to breast cancer patients, survivors, and their children, supporting a total of 409 people. In addition to Tempur-Pedic® mattresses, recipients received Pink Bags full of items such as clothing, shoes, beauty and personal care items, power banks, and hair tools. 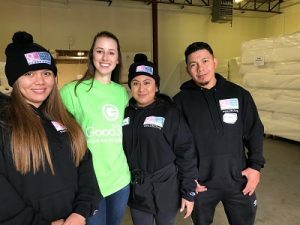 We look forward to continuing to work together with Good360 and Tempur-Sealy to positively impact the lives of those affected by breast cancer. For information on upcoming events, please visit our website www.UBCF.org or email GIKprogram@ubcf.org.